(Phys.org)—The world's first completely transportable research station officially opened in Antarctica on February 5. 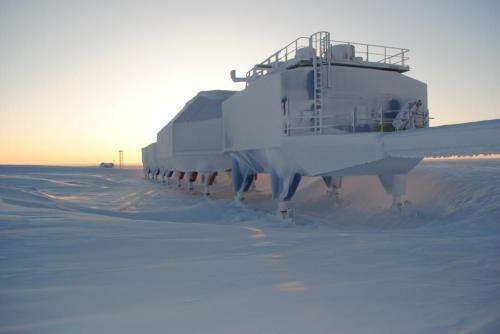 The Halley VI Antarctic Research Station, designed by Hugh Broughton Architects, utilizes a modular design that incorporates hydraulic legs fitted with skis. This design allows Halley VI to survive in conditions that have destroyed its five predecessors. Halley Research Station, devoted primarily to work in atmospheric science, was established by British Antarctic Survey in 1956. Halley researchers also perform glaciology and geology studies. Notably, scientists first recorded ozone layer depletion in the stratosphere above the Antarctic here. 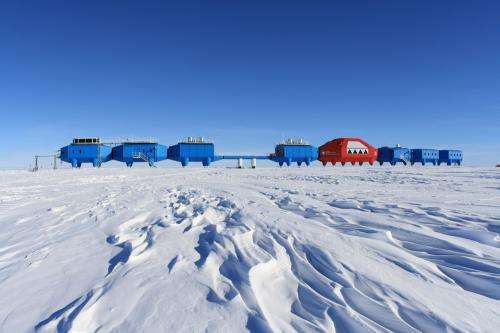 Antarctic conditions have caused problems for Halley research bases. Accumulated snow, measured at more than three feet per year, crushed buildings in the first four bases. Movement of the ice shelf toward the ocean at an annual rate of a quarter of a mile means that research stations are at risk of falling into the ocean when ice separates from the mainland. These factors give buildings that cannot be moved a lifespan of only ten years. Halley V had extensible steel legs, allowing operators to maintain the buildings above the snow's surface. The legs, though raised every year, were eventually trapped in 75 feet of ice. Because the station was rendered immobile, it was carried along with the ice and was therefore at risk of plummeting into the ocean when the ice caved. In June 2004, the British Antarctic Survey and the Royal Institute of British Architects (RIBA) launched a competition to design a new research station. In addition to being able to cope with moving ice and heavy snow accumulation, this new station would have to provide psychological comfort to the station's residents—around 70 in summer and around 16 in winter—who are at great risk of stress and depression related to the harsh Antarctic weather and permanent lack of sunlight in winter. Halley VI, commissioned in 2006, consists of eight connected modules, each of which sits atop hydraulic legs. The legs allow the individual modules to be raised above the snow. Additionally, placement of the modules at a right angle to the prevailing wind encourages snow to blow underneath the station. Skis positioned beneath the legs allow inland towing of each module, thereby minimizing its proximity to the ocean. Seven blue modules contain living spaces and laboratories. In consideration of the residents' psychological needs, a central red module, intended for use as a social space, contains communal dining areas, a hydroponic garden, and climbing wall. Colors were even chosen on the advice of a color psychologist. Construction of Halley VI began in Capetown, South Africa. The first modules were shipped to Antarctica at the end of 2007. 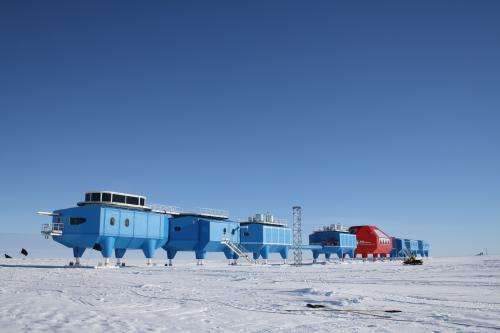 Halley VI delivered its first scientific data in 2012.